and/or increasing the value of the users already visiting your site. To earn more from your existing users, you can maximize the value of each page view, get visitors to look at more pages and visit your site more often. Let’s look at each of these levers in more detail. Growing the number of unique users starts with understanding your site’s traffic. Check your Google Analytics reports to see where your visitors are coming from and what content on your site drives the most traffic. You can use these insights to create compelling content that users can find and share. Allow both text and image ads. Implement the top performing ad sizes on your site. Allow as many ad categories as possible. To encourage visitors to look at more pages and spend more time on your site, clearly demonstrate the value of your content. Create a great first impression by making sure the information your visitors are looking for is the first thing they see. You can further increase your site’s page views per visit by showing your visitors that you have more great content they’d be interested in. You can achieve this by showcasing related or popular content near the end of the main content of the page. Creating a loyal user base is all about conveying to users that your site is regularly updated with new and interesting content. You can build loyalty by asking your visitors to subscribe to your email newsletter or social media channels. We hope this framework is useful when thinking about how to grow your website’s traffic and revenue. Let us know what you plan to do using the Long-term Revenue Framework in the comments section below. We hear from publishers around the world that they are looking to grow their site traffic and increase revenue. 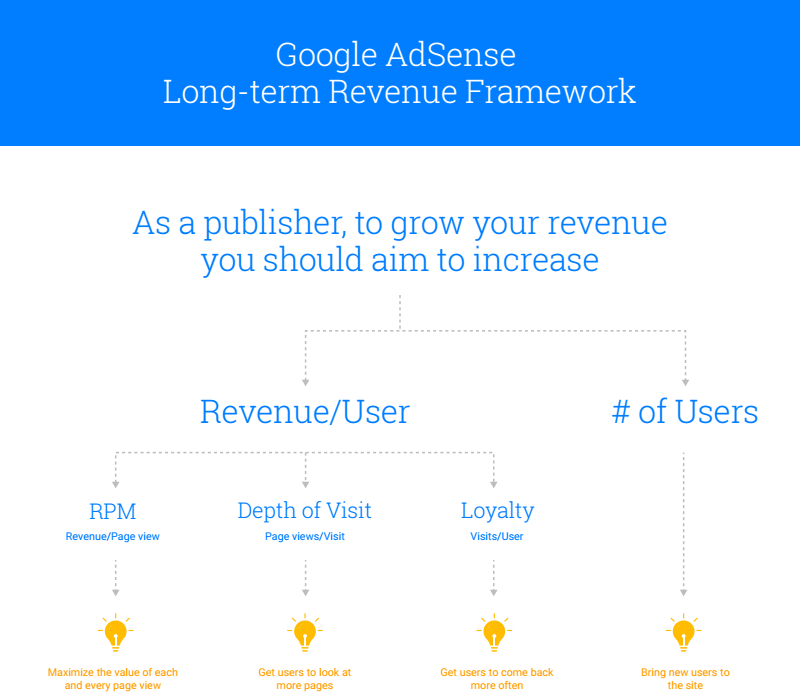 To help you accomplish these goals, we'd like to share the Long-term Revenue Framework—a tool often used by our AdSense optimization experts. The Long-term Revenue Framework below is a simple, but powerful framework to help you understand the four levers that can help you to grow your site. With this framework, consider your site optimization efforts in terms of the four levers outlined below. At the highest level, to help grow your site's revenue, try focusing on attracting more unique users and/or increasing the value of the users already visiting your site. To earn more from your existing users, you can maximize the value of each page view, get visitors to look at more pages and visit your site more often. Let’s look at each of these levers in more detail.